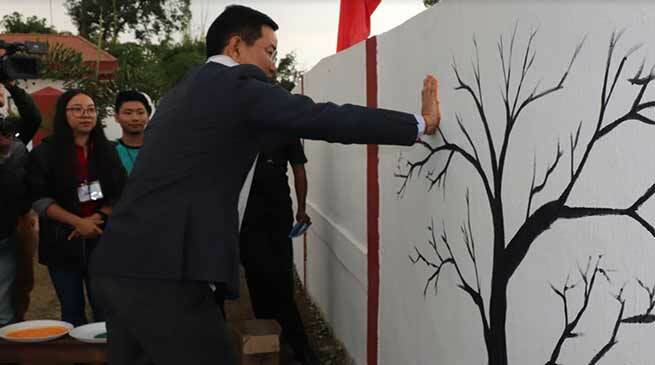 Minister Sports & Youth Affairs Dr. Mohesh Chai inaugurated two days Mural painting competition organised by APPWS. Addressing the function as chief guest Dr. Chai lauded the initiative of the APPWS in bringing the upcoming children and students to know the police who guard the society. Dr. Chai while lauding the state government for recently launching the Tourist Police and Surakhsa App for the safety and security of the tourist and general public with direct connectivity with the state police. Referring his support for the police development and law enforcing agency in his assembly constituency at Tezu in Lohit district, he said that he have done much for creating of infrastructure and a school run by APPWS since 2014 through MLADS, SIDF and other scheme and urge upon all the legislature colleague to help the police department in the development and better policing. Guest of Honour, Sahitya Akademi winner and Padmashree Mamang Dai in her address said that we should support and help the state police who have been doing lots of work apart of providing security to the general masses apart of law and order duty. Organising of such programme are interface of the public and citizens, it would give way for the chiders to know better about the police. Special Guest, Nandita Gopal spoke on relationship between Police and public and promotion of cultural and traditional relationship with students and younger generation. APPWD President and DGP SBK Singh, Chief Advisor Dr. Sushi Singh, Capital SP M Harsha Vardhan and other officers also address the gathering. A total of 258 participants are taking part in two days Mural painting competition which are held at three location at Chimpu Officer Mess, PHQ Chandranagar and at DGP resident at Vivek Vihar. Students from various schools and colleges of capital complex which include Donyi Polo Mission School for Hearing Impaired, Oju Mission School, KV-I, KV-II, KV PTC, NERIST, DNGC, NEHMCH, Green Mount School, Royal International School, Gyan Ganga etc.